Conrad, T.A. 1834. 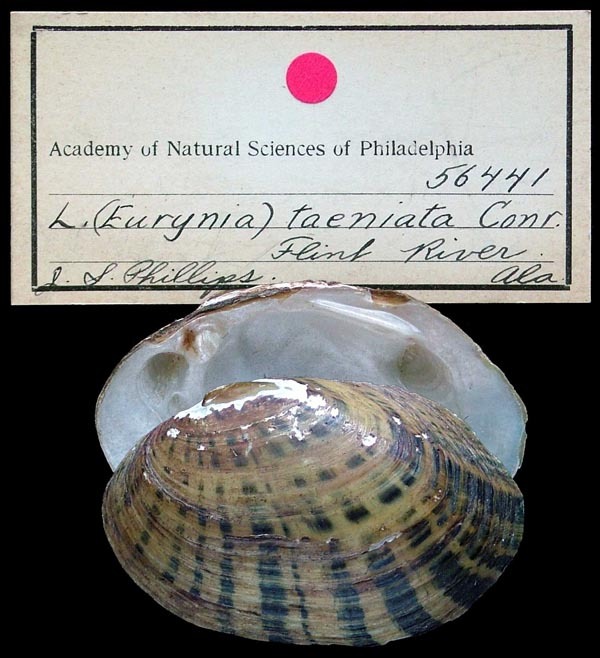 New fresh water shells of the United States, with coloured illustrations; and a monograph of the genus Anculotus of Say; also a synopsis of the American naiades: 1-76 + 8 plates. ‘Say’ Conrad, 1834, New Fresh-Water Shells: 73. Conrad, 1834, Amer. J. Sci. : 341, pl. 1, fig. 1. Conrad, 1834, New Fresh-Water Shells: 73. Conrad, 1834, New Fresh-Water Shells: 67. Conrad, 1834, New Fresh-Water Shells: 43, pl. 2, fig. 1. Conrad, 1853, Proc. Acad. Nat. Sci. : 244. 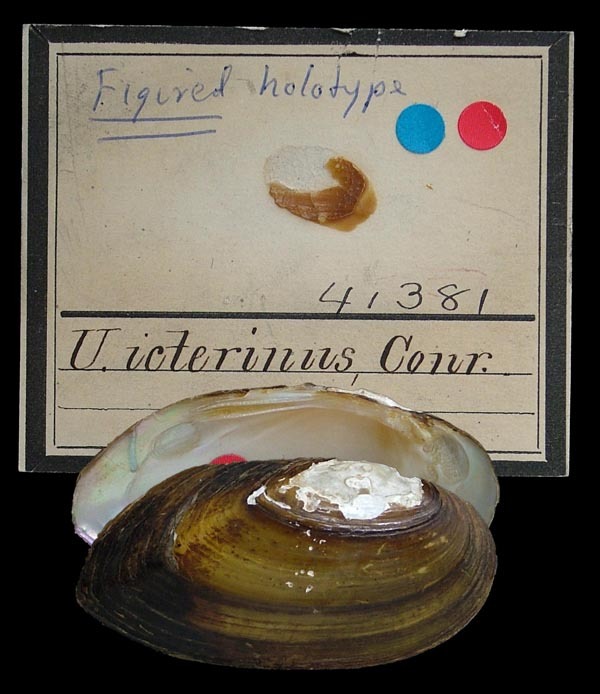 Type(s): HOLOTYPE ANSP_56419, Ogeechee R., Ga.
Conrad, 1834, Amer. J. Sci. : 340, pl. 1, fig. 9. Conrad, 1834, New Fresh-Water Shells: 36, pl. 5, fig. 4. Conrad, 1853, Proc. Acad. Nat. Sci. : 245. Conrad, 1834, Amer. J. Sci. : 338, pl. 1, fig. 1 [as ‘cœlatus’]. Conrad, 1834, New Fresh-Water Shells: 29, pl. 3, fig. 4 [as ‘cælatus’]. Conrad, 1853, Proc. Acad. Nat. Sci. : 245 [as ‘cælatus’]. 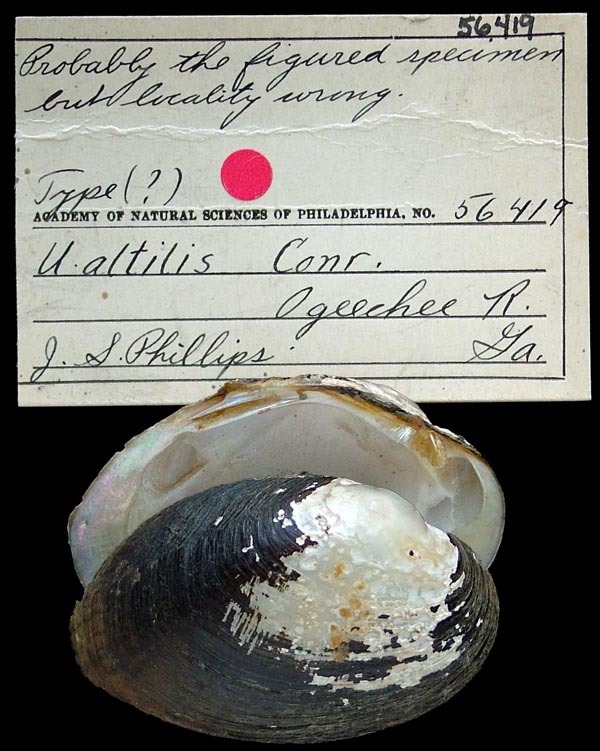 ‘Rafinesque’ Conrad, 1834, New Fresh-Water Shells: 68. 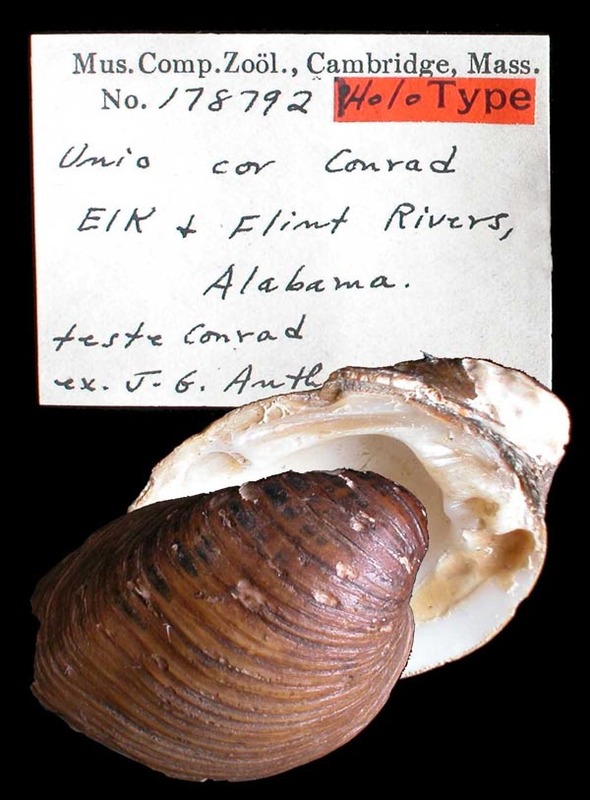 ‘Say’ Conrad, 1834, New Fresh-Water Shells: ??. ‘Say’ Conrad, 1840, Monogr. Fam. Unionidae: 115, pl. 64. Conrad, 1834, New Fresh-Water Shells: 28, pl. 3, fig. 3. Conrad, 1853, Proc. Acad. Nat. Sci. : 247. 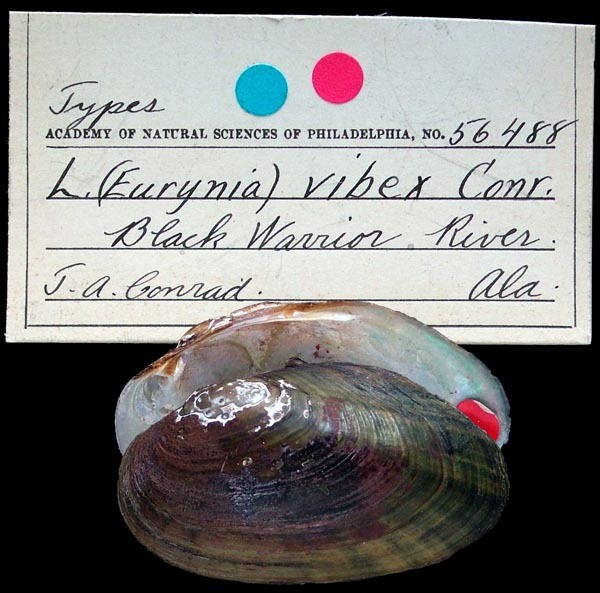 Type(s): HOLOTYPE MCZ_178792, Elk and Flint Rivers, Alabama. Conrad, 1834, New Fresh-Water Shells: 35, pl. 5, fig. 3. Conrad, 1853, Proc. Acad. Nat. Sci. : 248. Conrad, 1834, New Fresh-Water Shells: 32, pl. 4, fig. 1. Conrad, 1837, Monogr. Fam. 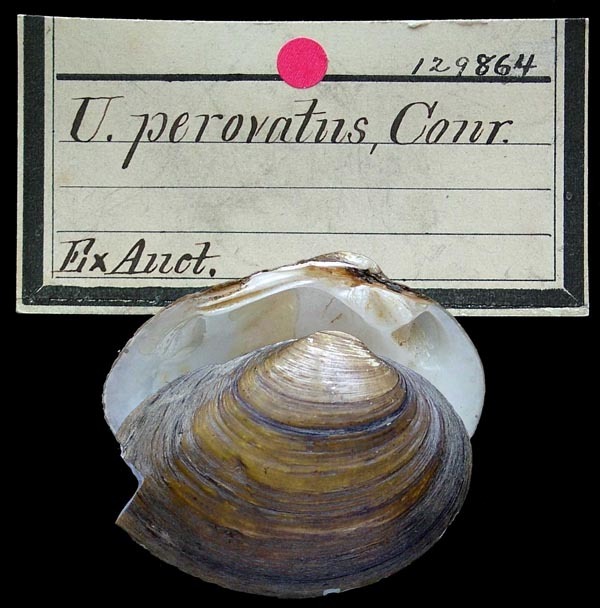 Unionidae: 69, pl. 38, fig. 2. 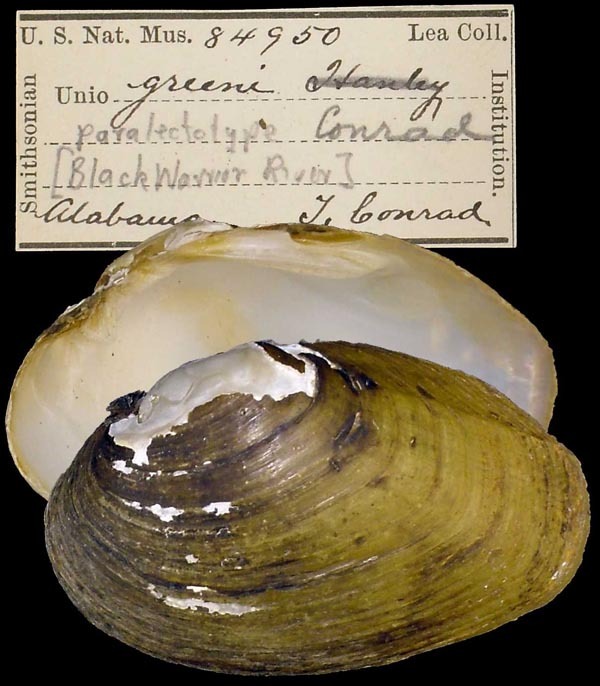 Type(s): SYNTYPE USNM_84950, [Black Warrior River] Alabama. Conrad, 1834, New Fresh-Water Shells: 45, pl. 3, fig. 2. ‘Rafinesque’ Conrad, 1834, New Fresh-Water Shells: 70. ‘Rafinesque’ Say, 1834, Amer. Conch. : pl. 68. Conrad, 1834, New Fresh-Water Shells: 30, pl. 4, fig. 4. Conrad, 1836, Monogr. Fam. Unionidae: 28, pl. 12, fig. 2. ‘Raf.’ Conrad, 1834, New Fresh-Water Shells: 69. Ferussac, 1835, Mag. Zool. : 28, 34. Conrad, 1836, Monogr. Fam. Unionidae: 25, pl. 11, fig. 1. 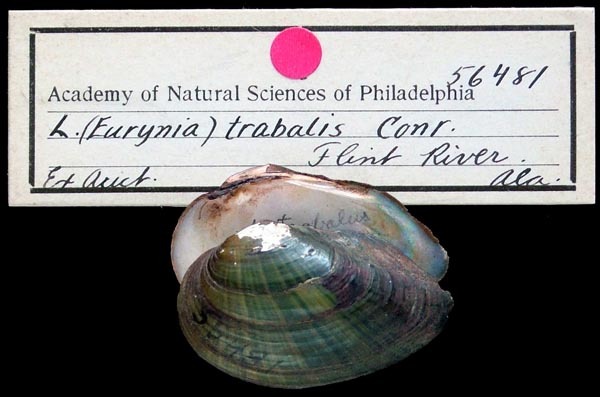 Conrad, 1834, New Fresh-Water Shells: 33, pl. 5, fig. 1. Conrad, 1834, New Fresh-Water Shells: 43, pl. 2, fig. 2. 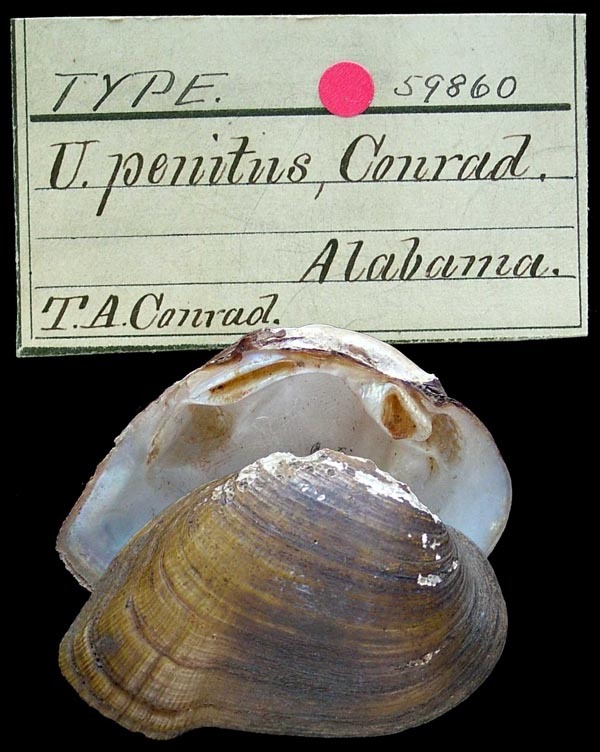 Type(s): HOLOTYPE ANSP_56416, Alabama R.
‘Say’ Conrad, 1834, New Fresh-Water Shells: 71. Conrad, 1834, New Fresh-Water Shells: 25, pl. 1. Conrad, 1834, New Fresh-Water Shells: 39, pl. 6, fig. 4. Type(s): SYNTYPE ANSP_41370, So. Carolina. Conrad, 1834, New Fresh-Water Shells: 42, pl. 7, fig. 1. 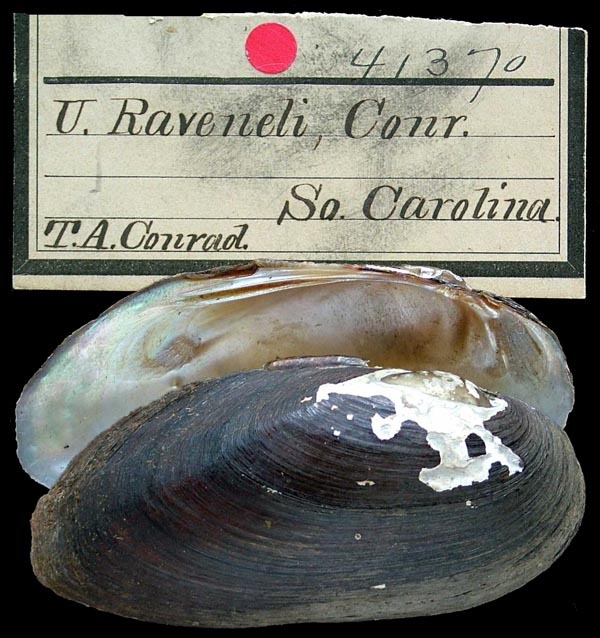 ‘Rafinesque’ Conrad, 1834, New Fresh-Water Shells: 72. ‘Raf.’ Conrad, 1853, Proc. Acad. Nat. Sci. : 259. Conrad, 1834, New Fresh-Water Shells: 27, pl. 3, fig. 5. Conrad, 1840, Monogr. Fam. Unionidae: 110, pl. 60, fig. 2. Conrad, 1853, Proc. Acad. Nat. Sci. : 259. 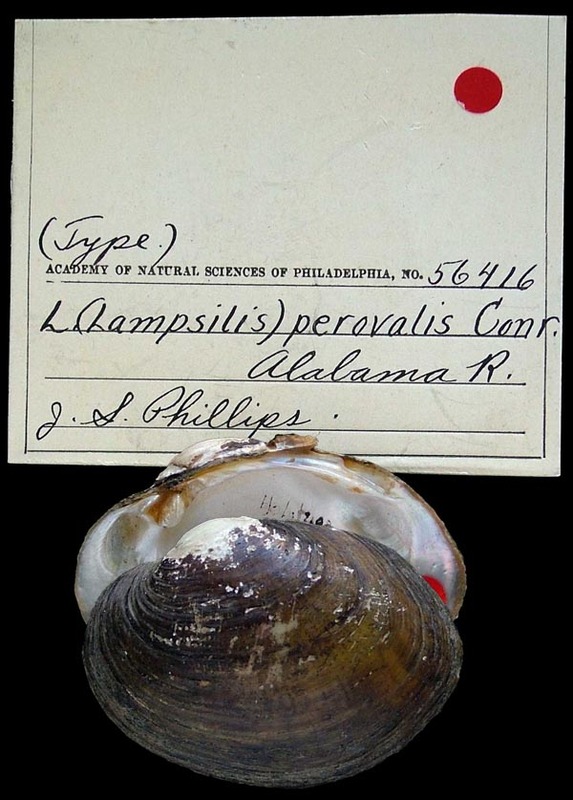 Type(s): HOLOTYPE ANSP_56481, Flint River, Ala.
‘Barnes’ Conrad, 1834, New Fresh-Water Shells: 72.